The start of an idea. Many ideas for books form very slowly, and only come together over the course of years. In a few cases, an author can pinpoint exactly when the idea began to form. I began thinking seriously about the role of rest in creative lives, a line of inquiry that resulted in my latest book, during a winter evening I spent with my wife and two books. I was a visiting fellow at Microsoft Research’s laboratory in Cambridge, England, working on a project that eventually turned into my book The Distraction Addiction. 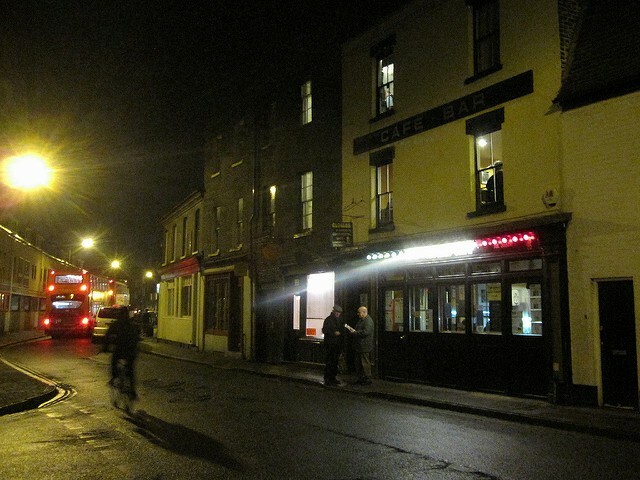 During our months in Cambridge, we would often go to one of the town’s many cafés or pubs after dinner. On this evening, we settled at a table at Clowns of Cambridge (in the upstairs, which didn’t have slightly creepy clown marionettes dangling from the ceiling). I had a stack of articles and two books I was reading: Virginia Woolf’s A Room of One’s Own and John Kay’s Obliquity. In A Room of One’s Own, Woolf compares the lives of dons at well-endowed ancient colleges and the pinched existence of faculty at the newer women’s colleges. The ancient colleges offered far greater opportunities to excel, according to Woolf, not because of their richer endowments but because of their more leisurely pace: generous research budgets and obliging staffs gave faculty time for long walks and lengthy conversations. Meanwhile, in Obliquity John Kay observes that companies that flourished when they focused on great work and customer service often stumble when new executive teams institute strategies focused on improving financial performance. Companies that put profits first, Kay argues, are more likely to lose money than those that treat profit as a by-product of doing great work. These two books triggered an insight about a third that I had been carrying around like a good luck charm, hoping that some of the success the author enjoyed during his time in Cambridge might rub off on me: The Double Helix, James Watson’s account of his and Francis Crick’s discovery of the structure of DNA, one of the great discoveries in twentieth-century science. I’d read The Double Helix several times, and usually I focused on the competition and conflict in the story, but Wolff’s argument that leisure en­ables productivity and Kay’s idea of obliquity made me aware of something I’d never paid much attention to. Watson and Crick didn’t just spend time hunkered down in the lab. Lots of the action happened over long lunches at the Eagle pub, during afternoon walks around Cambridge, or while brows­ing in bookstores. And despite being locked in a race against some of the most brilliant scientific minds of the century, Watson was constantly running off to conferences, going on vacation in the Alps, or taking time off to play tennis. One of his con­temporaries said that Watson had time for girls and tennis because he was a genius. But Woolf and Kay made me think: Maybe he was a genius because he made time for girls and tennis. Maybe creative achievement needs to be approached obliquely. This idea lay in the back of my mind through the winter. My wife and I both worked hard and got a lot done during our sabbatical, but we also found time for evenings in the pub, Sunday walks to the Orchard, quick trips to London, and weekends in Edinburgh and Bath and Oxford. It was an intense and productive time, yet also oddly unhurried. As ardent Anglophiles, we found being in Cambridge intellectually energizing. But I began to wonder if our productivity had as much to do with pace of our lives as the place we lived. I started to think that maybe our familiar ways of working and living and our unquestioned assumptions about the need to stay always connected, to keep one eye on the inbox at the playground or the dinner table, to treat weekends as a time to catch up on work, and to hold vacations in contempt, ac­tually don’t work as well as we think. It would require a couple more years, and many more books, before I made that argument in full. But the fundamental idea that rest and leisure were more important to creative life than we realize; that our over-scheduled, over-stressed lives make us lose touch with that reality; and that we can learn to make room for rest in our busy lives, and do better work as a result, never wavered. Nor have I forgotten how reading A Room of One’s Own and Obliquity sparked the idea that eventually led to Rest.